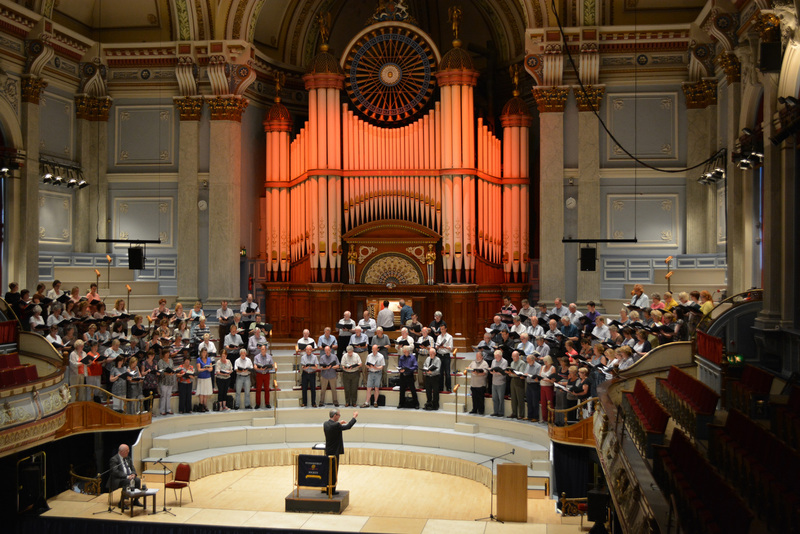 Founded in 1836, the Huddersfield Choral Society is one of the great survivors from the age of choral singing in Northern England. Both Elgar and Parry conducted the choir, and these two composers featured in the choir's concert at St John the Baptist Church, Buxton as part of the Buxton Festival. Conducted by Aidan Oliver, the programme included predominantly sacred choral music from the early 20th century with Elgar's Ave Verum, three of Parry's Songs of Farewell and I was glad, Stanford's Fantasia and Toccata for Organ, finishing with Rachmaninov's All Night Vigil (Vespers). The Huddersfield Choral Society's regular concert series concentrates on large scale works with orchestra accompaniment, so it was intriguing to hear them in a programme of largely unaccompanied choral music. 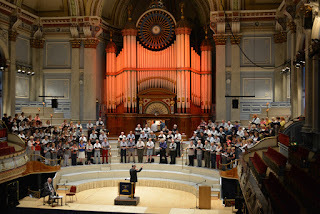 The repertoire for the concert is one which I am familiar with singing in far smaller chamber choirs, but it is worth noting that whilst Sir Arthur Sullivan was conducting the Leeds Philharmonic Chorus the repertoire include quite a lot of music which we would nowadays think of as chamber choir repertory. In Buxton, there were around 125 choristers present, crammed into five rows across the nave of St John's Church. The building is a large rectangular Regency box, but this is probably about the largest group that the building could take. The setting of the Ave Verum by Edward Elgar (1857-1934) dates from 1902 and is based on an earlier piece. Written for choir and organ, it is one of the composer's smaller, practical motets for church usage (his father was organist at St George's Roman Catholic Church in Worcester). Hearing the Huddersfield Choral Society in the piece, what was noticeable was the lovely, warm, soft-grained tone which the choir made, and the admirable response and flexibility of the singers. They followed this with three of Hubert Parry's Songs of Farewell. These were written for unaccompanied choir, setting a variety of texts and Parry devoted a large part of 1913 to writing them but the set of five were not finished until 1915. Though some were premiered in his lifetime, and one performed at his funeral in 1919, the full set was not performed until a memorial concert in 1919. Hubert Parry (1848-1918) was one of the key players in the English musical Renaissance, and was notable as a teacher, but by the early 20th century his Brahms inspired style was starting to seem a little dated, but we can now appreciate the fine expressive craftsmanship in the works. We heard My Soul there is a Country (setting Henry Vaughan 1622-1695), Never Weather-beaten Sail (Thomas Campion 1567-1620), and There is an old belief (John Gibson Lockart 1794-1854). Hearing the three, with the lovely sound of 125 people singing quietly and with a very good feeling for the words, I was again struck by the choir's very particular sound. With a predominance of mature voices, there was a nice vibrato-laden texture but this wasn't a massive immobile instrument. The climaxes were wonderfully shattering, but there was a feel for the flexibility of the phrasing too. Aidan Oliver's speeds were on the whole steady, but not stodgy, and though there was the odd smudgy passage on the whole the sense was of a fine, alert choral instrument. Charles Villier Stanford (1852-1924) was the other notable architect of the English musical Renaissance. A fine organist and choir trainer as well as a composer and teacher, his largest work for organ is the Fantasia and Toccata of 1894. We heard it played on the fine William Hill organ which, rather aptly dates from 1897. The Fantasia is a multi-sectional movement with contrasting grand Bach-ian prelude like sections and quieter moments, and the movement ends quietly leading into the Toccata with its spectacular pedal opening. The main theme of the Toccata is interestingly uneven and irregular in terms of its metre. It was a brilliant piece, not withstanding some slightly hackneyed turns of phrase in the harmony, and received a superb performance with the organist giving the organ a good work-out. We finished the first half with choir and organ joining forces for one of Parry's best known pieces, the anthem I was glad written for the 1902 coronation and setting words from Psalm 122 which had been sung at every coronation since that of Charles II. It is a thrilling work, but one which is subtle too and Aidan Oliver's performance with the Huddersfield Choral Society made a point of both of these, giving us some finely focussed climaxes and some lovely flexible quiet moments. After the interval we made a switch of continent and mind-set, for the All Night Vigil by Sergei Rachmaninov (1873-1943). Written in 1915 as a memorial to a friend, Stepan Smolensky, who had been Director of the Court Chapel Choir, it follows all the rules required of Russian Orthodox sacred music but in fact Rachmaninov envisioned it as mainly a concert work. Rachmaninov only set the major hymns from the service, and did not include the more dialogue like elements between celebrants and choir. For their performance, Aidan Oliver and the Huddersfield Choral Society brought in a number of these elements, including sung chant and intonations, prayers (read in English), a gospel reading and the all important bell to give more of a feel for what the service might be like. The liturgy was arranged for the Feast of the Transfiguration (6 August 2015) which meant the loss of three of Rachmaninov's movements and frankly I would have preferred a less precise attitude so we could have heard all of Rachmaninov's music. Tenor soloist Ben Thapa sang the solos in Rachmaninov's piece as well as some of the extra chant, whilst the majority of the chant was sung by Barrie Mortimer, with Rowena Burton as the alto soloist. Though Aidan Oliver did use a smaller group for some sections, the main choir responded admirably and gave us a finely fluid account of the work. The second basses in the choir showed themselves well able to cope with Rachmaninov's demands for a bottom B flat. Rowena Burton was a lovely even, firm-toned alto soloist, whilst Ben Thapa brought a thrilling, almost operatic expressiveness to the tenor solos. Barrie Mortimer, who sang most of the extra chant, showed himself to have a good command of both the low register and the Russian language. The choir made a lovely warm sound, with a beautiful clarity of texture from the women in some of the quieter moments, and a fine, rich warm sound from the men with a good strong bass foundation. The hushed sound of the choir really worked magic places. It has to be admitted that there were the inevitable smudgy passages, and a couple of awkward transitions, but overall these did not mar the general sense of the piece and the way all concerned seemed to really participate in it. Naturally, with 125 singers at his disposal Aidan Oliver was able to give us some thrilling climaxes, but he wisely did not push this. Also very noticeable was how his speeds sometimes took no prisoners, and this was not the massive monolithic account of the work that I had expected and the choir showed itself deft in its manoeuvrability. The Magnificat started with a fabulous dark sound from the lower voices, and led into the Great Doxology which developed a truly wonderful head of steam so that the ending was thrilling, and this continued with the glorious final To Thee, The Victorious Leader.